BIG BUSINESS Digital Agency WebOracle is a full scope award winning digital agency, which has provided bespoke digital service throughout Melbourne Australia and Internationally to clients for over sixteen years. We work with large tier one companies “Big Business” through to small SMB’s “Small Business”. We are experts in; Web Design We provide Website Design in Melbourne for small and large businesses in Australia. Our creative web design agency in Melbourne follows a thorough step-by-step process that ensures our clients receive a professionally well designed website that talk to their clients. Good web design is a very important part of communicating with your audience, it is the first impression that will send a message to the visitor to decide if they will continue to stay on your website or not. Online Marketing and SEO Experts We have worked with just about every successful company throughout the country providing expert SEO services and Online Digital Marketing Strategies. Working closely with our clients we map out exactly what they are trying to achieve in this step. Once we have a complete understanding of your requirements, we then set off and create a full comprehensive technical audit of your website. This means ensuring your website loads quickly into potential client browsers. Video can often affect loading times on your website resulting not only time delays in loading, but creating a high bounce rate. The higher your bounce rate the lower you will rank. Google does not look at this favorably. We also look at each of your pages to make sure you have titled them correctly and have correct URL structures, meaning – That if your Home page is Just titled “HOME” someone looking for your business, which in our case is WebOracle, and they type in WebOracle we will not be found. Why? Well Google read URL structure and Page titles. Content Audit – If your website has lots of internal pages, we would look at reducing the amount to around 50% . You may say that this will reduce the amount of Visitor, and yes, you would be right. The reduction in visitors is not a bad thing as the content reduction and structure would be geared to the right audience providing the correct information for your visitors. This makes it far more interesting and easier to manage, not to mention your Bounce Rate will dramatically reduce. The Content Audit will make sure the content is relevant to your target audience. Once Google recognizes this, you should find a higher rate of conversion. Once the content has been audited and correctly structured, we will then apply this to your website. This process will be continued throughout each and every page, with internal linking to relevant content on other pages. This will ensure your visitor can access all the relevant material, which in turn will provide a better user experience. These are just some of the techniques we apply to your website in order to make it more visible and most importantly provide your visitors a better user experience. We have helped all types of big data business achieve their desired goals. We specialize in working collaboratively with you especially if you have complex big data and server requirements. Our expert team of professionals will discuss your requirements in great detail and provide you with a very comprehensive and detailed first stage approach to all your online and Big-Data needs. We are experts in Java Script, Server Migration, Server Configuration, Agile Web Development, PHP, .net, User Experience, UI, Design, Strategic Planning, SEO, Online Marketing, eCommerce, Content Marketing, Landing Page Optimization, Oracle Data Base Specialist, Microsoft Severs. For Further Information on how we can help you achieve your online goals Contact Us Now. Jet™ Small in size, big on success. 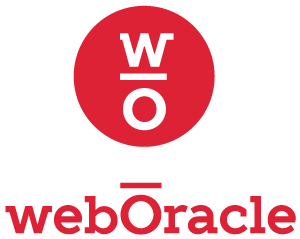 Web Oracle is an innovative, dynamic and creative agency that aims to help grow, develop and enhance your business online.